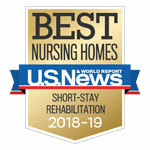 St Mary of the Woods has been awarded the US News and World Reports 2018-2019 Best Nursing Home Designation as well as the 2018-2019 US News and World Best Short Term Stay Nursing Award. 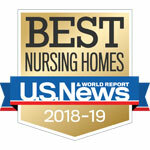 Only 19% of the nursing homes in the United States have earned this honor. Click the award icon to learn more about this award. Once known as a farming town, the city of Avon has transformed into a vibrant and thriving area where the town’s residents can find everything they need. The Lorain County Metro Parks’ Miller Nature Preserve displays prehistoric ferns to exotic orchids in its new conservatory, and the historic Avon Isle Park Dance Pavilion lets residents kick up their heels for an evening of dancing and memories. This wonderful variety of activities makes Avon a perfect home to our St. Mary of the Woods. Our staff members are proud that our community serves as our residents’ home and a gathering place for family and friends. St. Mary of the Woods is a distinctive faith-oriented community offering 81 independent living apartments, 47 assisted living apartments, and a 30-bed skilled nursing and rehabilitation community. Our residence features gorgeous architecture, spacious residences, unparalleled hospitality, and a beautiful chapel offering daily services. With a continuum of services, our staff members provide individualized care for every resident we serve. St. Mary of the Woods is a skilled nursing and rehabilitation community. We are dedicated to rehabilitating each resident in a results-driven, clean and friendly environment. Our professional nursing staff provides physical therapy, occupational therapy, and speech therapy, as well as intravenous therapy, pet therapy, pain management and wound care. Our services help restore the quality of life to our residents and enable them to reach the highest level of independence possible.